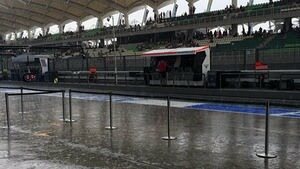 Qualifying for the Malaysian Grand Prix was delayed by almost an hour due to the daily torrential downpour that hits the track. Eventually, the running got underway, with a handful of surprises up and down the field. The first two sessions both saw red flags, whilst we also had a few tyre strategy decisions going on - despite it being the wet compounds in use. If you missed any of the action, or want to relive what happened lap by lap, then this Factbyte Factbox replay is exactly what you need. Stacked with quotes from drivers and team members, plus descriptions of each session in detail, it'll feel like you were there! Hello F1 and fact fans, how have you been? The Formula One circus has moved on to Malaysia, where we're anticipating qualifying in just about half an hour. At this very moment in time, though, there's only one word on anyone's lips: RAIN! It's hammering it down in the pit lane, Claire Williams has already admitted they're hoping it clears up before the qualifying session begins - to get the rain out the way before the action. There's furious work going on in the Lotus garage - the team have had a troubled weekend so far, with little running on Friday. Final practice this morning was better, with 36 laps between the two drivers. McLaren were the team struggling in final practice and there's talk that they may not make qualifying either. If there's a rain delay, that could work in their favour. @CaterhamF1 have shared just how damp it is out there: "Meanwhile... It continues to bucket down (technical term fact fans)." Adrian Newey: "Our straight line speed is not very strong, so these weather conditions probably suit us. We had a good outing in the wet in Melbourne with Daniel. If it's as wet as this, they'll probably have to delay qualifying. "They're very different cars, and we had very little time to sort it out, we didn't get very much testing done on the dyno before the first test, which is where you get to sort out all the problems before going out in the public eye. The problem was a local heat problem on our side... it takes a bit of time to sort it out. It wasn't a huge problem, it just took time. When the tests come that fast and quick it's embarrassing to know you have a solution but can't get it on the car yet. "Where we are the moment, it's very much an engine formula, which means it's in the hands of the engine supplier." Tweet from @InsideFerrari: Still raining hard. If it continues it is likely the session will be delayed. Swimming suits out! The rain is showing no sign of letting up, so qualifying has been delayed by 15 minutes. It's fair to say no one is expecting that to be the only delay, either. 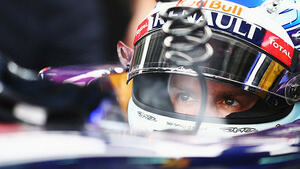 Music is pumping in the Red Bull garage, Sebastian Vettel is staring into space, miles away. Tough for the drivers to be in the zone and then have to delay the zone a little bit. Lots of frowny faces up and down the pit lane. Ferrari's Stefano Domenicali stares out at the rain, arms folded, face pensive. Nico Rosberg is having a snack in the garage, watching some of the screens... actually watching himself on screen. Start of Q1 delayed by a further 15 minutes - next update at 16:20. Daniel Ricciardo is having a chat with Christian Horner and Helmut Marko, they're laughing and joking, so not too tense on that side of the Red Bull garage. Interesting that the bosses are over Ricciardo's side of the garage. Understandable that Vettel may be in the zone and not very talkative, but I don't ever remember seeing Marko sharing a joke with Webber. @Lotus_F1Team have started a pun game, Canoe Kobayashi, Nigel Man-sail, you get the idea. Still raining heavily, more delays expected. We're seeing people scampering about in the paddock, you don't want to stand out in that rain longer than necessary! Ted news: "It is brighter, but the intensity of the rain remains as hard as it has been for the last five minutes." At a push, he says it is "gently" easing up. 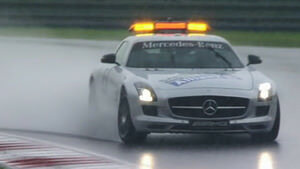 The safety car is out on track doing a lap to test the conditions. It's wobbling around like crazy, though. Start of Q1 delayed by a further 15 minutes - next update at 16:35. Jan Magnussen is in the McLaren garage, chatting with his son - who in turn is wearing one of those cooling vests, and looking pretty relaxed despite the delays. Max Chilton peers out of the garage into the pit lane, it looks like the downpour has stopped, although plenty of moisture still in the air. The sun is definitely trying to break through the clouds, things are looking more promising BUT the official radar says there is still plenty of rain in the skies about 4km from the track. The safety car is out for another exploratory lap. It's looking much more steady on its tyres this time. Pitlane crews are out in force with their drying equipment, pointing them at the pit boxes to try and clear up the concrete. Kimi Räikkönen has climbed into the car and is getting strapped in. That's promising. Start of Q1 delayed by a further 5 minutes - next update at 16:45. Just a five minute delay rather than fifteen, that has to be a good sign. Monisha Kaltenborn: "We've certainly made progress from Melbourne, we still aren't quite there but the measures we brought here have worked. It's a small step but a step in the right direction. Obviously, Adrian wasn't happy with a few things this morning. Otherwise we're pretty fine with the direction we're going. 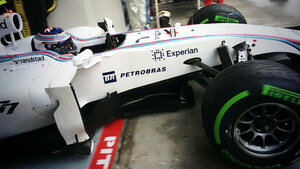 "It's very pleasant to work with Sutil, you need to have a good basis. He's critical about things but that's his job. A very different character to the drivers we've had before and it helps that he's not too far from the factory, he's built up a good relationship there. I think we'll get a long way ahead together. "Esteban had a first rough season but I think he's learnt a lot, and that's what that season was there for. He makes his experience, he learns from the mistakes he's made and we'll see how he delivers this year, we'll see how he makes use of what he's learnt." Safety car is out yet again, it's looking a lot better now. Some spray so visibility might be tricky but the standing water is mostly cleared. Tweet from @Marussia_F1Team: The humidity is running at a deeply unpleasant 95%. Air 25, Track 34. 16:50 start of qualifying confirmed. So just a handful of minutes to get prepared, drivers are getting strapped in. The two Mercedes drivers head out to wait at the end of the pitlane. A queue forms behind. Lewis Hamilton leads the queue, but almost all cars are piling up behind. There's still two minutes to go as they sit there, steaming! Full wet tyres on the McLaren of Kevin Magnussen, intermediates on most of the others. Team radio to Hamilton: "Okay Lewis, we do expect rain in the session so make early laps representative." Button also has the blue stripes on. Marcus Ericsson has stopped in the queue, the rest of the cars are filing around past him. He had waved at a mechanic but the green light stopped them doing anything immediately. 14 drivers hit the track straight away, Ferrari wait for a moment, as do both Red Bull and Sauber drivers. They're all heading out gradually though, as rain is on the cards. Now every single car is out and starting a warm up lap, except for Ericsson. Team radio from Maldonado: "I think it's okay for inters at the moment." Hamilton crosses the line to start a flying lap, as the lead driver he has good visibility, those behind have to deal with massive spray. Button's radio suggests they will do a lap on the extremes and then switch to inters. Caterham have finally got Marcus Ericsson running, he's headed out on track with intermediate tyres on. Hamilton's first lap time is a 1:57.309. Nico Rosberg immediately drops the time by two tenths. Magnussen is instructed to come in for intermediate tyres, the full wet gamble potentially not the right call. Alonso slips into third place with a two minute lap time, that's three seconds off the Mercedes pair. Nico Hülkenberg pushes Alonso down by taking third place, he's posted a time of 1:59. It's Ricciardo's turn to jump into third, the rest of the pack are slowly closing the gap to the Mercedes pair. Team radio to Vettel: "Problem with the car, box please." Grosjean has popped up to fifth place! No way he'll stay there, but hey, go Lotus! Sergio Pérez has also jumped up the order, slipping into fifth place and knocking Grosjean down a place. Team radio to Grosjean: "Okay, rain is getting heavier." All drivers have set a time except for Magnussen, who had to come in for the intermediate tyres and is now hustling to complete a lap time before the rain comes down. Vettel's radio informs him of a problem with the energy store, he's back in the garage. Currently he's in tenth place. Magnussen's first lap time is good enough for 14th, that's out of the drop zone for now but isn't totally safe. The current drop zone features Sutil, Bianchi, Button, Kobayashi, Chilton and Ericsson. Vettel's back out on track, looking to improve on his lap time of 2mins. Bianchi and Kobayashi return to the pitlane, as Alonso also files in. Magnussen improves to 12th, and Button also improves up to 15th place, but that's not the safe position he would like. Maldonado has fallen into the drop zone now. Five minutes left on the clock. Rosberg, Hamilton and Hülkenberg are the quickest three. Brief yellow flags as Esteban Gutiérrez runs off track but continues. Jules Bianchi is on a hot lap, the Marussia looks a handful as he sweeps through the second sector. It's drifting with little grip as the Frenchman tries to improve on his 19th place. Rosberg and Hamilton have both come into the pits, it's unlikely we'll see them again this session. More yellow flags as Sebastian Vettel runs wide at turn nine, but also continues. On board with Gutiérrez shows a big puddle on the inside of the final corner, drivers are running wide to try and avoid it. Less than a minute to go, Maldonado and Sutil the two drivers needing to improve. Marcus Ericsson has crashed, debris everywhere, the car stopped actually on the track. Marshals running to clear the car. Session stopped. Marcus is moving around fine but taking his time to get out. Lots of unbuckling and he finally steps from the vehicle. The medical car has arrived, but Ericsson physically jumped out of the car so he doesn't look too bad. Replays show it was a big hit into the wall, bashing into one side of the circuit and then taking out the marker board, spreading debris all the way across the track. Lots of marshals swarm the stricken Caterham, as the tractor moves in to recover the car. The track has been swept clean, super impressive work from these marshals. Q1 session will not restart. 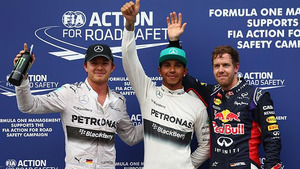 The fastest three in that session were Nico Rosberg, Lewis Hamilton and Sebastian Vettel. A bad session for Maldonado, considering Grosjean hauled his way up to 11th, there was about two seconds between them. The second session is moments away, and Mercedes are sending their drivers out to wait at the end of the pit lane again. They have full wet tyres on. Kimi Räikkönen is heading out on the intermediate tyres, the McLaren drivers have full wet tyres on. Lewis Hamilton heads the queue again, Pérez splits the two Mercedes in the battle for pit lane position. Looks like both Ferrari drivers have opted for intermediates, as well as Valtteri Bottas. Meanwhile, the Red Bull duo are letting the rest of the pack head out whilst they wait a moment or two in the garage. And they head out, so that all 16 cars are out on track. Visibility is a little worse this session. Replays show a small collision between Kvyat and a Ferrari, but it was quite minor, not worthy of a red flag. Unless it's for the conditions. Drivers pouring back into the pit lane, no lap times on the board yet. It was Alonso involved in the incident with Kvyat. As he's pushed back into the garage, we can see Alonso's front left track rod has become disconnected from the chassis. Replays show Alonso went wide around the corner, Kvyat took the inside line, and the Ferrari just turned in and the two collided. May have been conditions, may have been on the wrong tyres, or may have just been a Fernando fail. Cars leave their garages and head to the end of the pit lane again. Esteban Gutiérrez leads the queue, it's wet tyres all round except for Bottas, who clearly likes those green stripes! The Ferrari crew are attempt to patch up Alonso's car to send him back out again in this session. All other drivers are out on track, with just Bottas on the intermediate tyres. Fernando Alonso does leave the garage and heads out on track with the wet tyres on. Turn 9 incident involving Fernando Alonso and Daniil Kvyat will be investigated after qualifying. Lewis Hamilton sweeps round the final corner to cross the line for the first time of the session - 1:59.419. This time, Rosberg can't match it and settles in second place, one entire second slower than his teammate. Both McLaren drivers are warned on the radio to warm the brakes, as Kevin Magnussen pops up to third place. Romain Grosjean also doing pretty well, sitting in ninth at the moment. Daniel Ricciardo splits the two Mercedes cars, as he takes second place for now. Grosjean dropped down the order and manages to improve to tenth place, but by no means safe. The current drop zone, with six minutes to go, features Gutiérrez, Massa, Button, Vergne, Kvyat and Bottas. Yellow flags as Magnussen spins off track, through the gravel but recovers back out and dives straight into the pit lane. Three minutes left on the clock. Bottas asked his team about his lap times (currently six seconds off the pace), and asked if he should switch to full wets. He has bolted the blue stripes on. Hamilton improves again, the P1 time now 1:59.041. Two Red Bulls were sitting behind him, but Rosberg jumps up to P2. Magnussen's off-track excursion. He's currently in the garage. Drop zone, with one minute left, features Grosjean, Gutiérrez, Massa, Vergne, Kvyat and Bottas. Kimi Räikkönen is also in the pitlane, along with Magnussen, the pair not running in this final last ditch effort for pace. Gutiérrez improves to tenth place. Bottas improves to 12th, unable to make it out of the bottom six. Kvyat jumps up to tenth, dropping Gutiérrez back down again. Vergne does exactly the same, moving up to tenth place and pushing his own teammate into the drop zone. Grosjean messed up his final lap with a massive spin, avoiding any damage but he'll be last in that session. The fastest three for Q2 were Hamilton, Vettel and Rosberg. Q3 will start at 17:47. Team radio from Grosjean: "Rosberg screwed me on my fastest lap." Grosjean explains the Mercedes was doing a slow lap in front of him, he couldn't see and he tried everything for that final lap. Then apologises to the team. But hey, they're out of Q1 at least! Marcus Ericsson: "It was really slippery out there, I was trying to build my pace. I just did a mistake which caught me out. The car seems to be quite damaged. 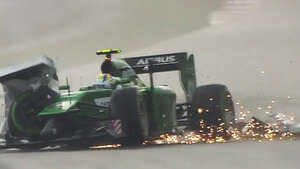 I'm sure the guys at Caterham will work quite hard overnight, we should be fine tomorrow." So, in the top ten shootout, we have both Mercedes and Red Bull drivers, both McLaren and Ferrari drivers, plus Hülkenberg and Vergne. The cars pile out of the pit lane, there was a brief queue at the end and this time it wasn't headed up by Mercedes. All ten drivers are out on track, it looks like it's wet tyres on all but the two McLarens. Magnussen radio asks him if it is too wet for winters, he confirms it is, so will be visiting the pit lane to swap for full wets. Button, however, is comfortable on the intermediates, coming in for a fresh set. Kimi Räikkönen sets the first lap time of the session, a 2:01.218. Hamilton immediately drops the benchmark, 1:59.431. Rosberg again can't improve, he's just a tenth over the two minute mark. From the comments, Steven Roy: "If it is a wet race tomorrow no-one is going to have any wet tyres left"
Both Vettel and Alonso have put their first benchmark times ahead of Rosberg, with Ricciardo settling into fifth place for now. Neither McLaren driver has set a time yet, having been messing about with their tyres in the first part of the session. Hamilton's second lap, despite being told to push, push, push, doesn't improve on his first. Magnussen pops up to 7th, with Button down in 10th - four seconds off the pace, but on the intermediate tyres. Räikkönen comes in for a fresh set of wet tyres, having complained over the radio that his last lot were worn on the rears. Button rounds the final corner, remaining on the intermediates. He's barely improving his time, still in tenth place. Meanwhile, Hamilton says it's starting to rain harder, which won't help Button at all. Just ninety seconds left on the clock, the standing water is starting to get in the way again. Team radio from Hamilton: "I can't see anything out of my mirrors. I don't know where anyone is." Vettel aimed to be the last across the line, but just missed out and can't run again. He's sitting in second place now, but has no chance to improve. Räikkönen doesn't improve on his own sixth place time. Magnussen also cannot improve, remaining eighth for now. No one is improving at this point, conditions worse than when their initial lap times started. Having said that, Nico Rosberg improves to third place, pushing Alonso down to fourth. He was the only driver to improve on that final lap. Pole position for Lewis Hamilton with a time of 1:59.431. Missed it at the time but the stewards will investigate a potential impeding incident between Daniel Ricciardo and Valtteri Bottas. Jenson Button: "I think when you're probably going to be eighth on wets, it's worth a punt. It is what it is. We didn't think it was going to rain again, it was worth a go. It was pretty wet at the back. I chose to go on inters, I normally make the call and get it right but I didn't today... If we were quick enough for fastest on wets, no, it's not worth a go, but when you're fighting at the back of the top ten, give it a go, see what happens." Bit early for this, but let's go for it anyway. Hamilton leads the way for the Pole Trophy! Press conference quotes - Lewis Hamilton: "Bit all over the place at the moment. I’m really happy with the job the team have done, and just generally how well we’ve done all weekend. Today was incredible, firstly how much it rained before qualifying, and then during the session… Particularly at the end, I just couldn’t see a thing. Didn’t know where the corners were, where to brake… It was a little bit too close but very happy to be here." Press conference quotes - Sebastian Vettel: "Beginning of Q1, the heartbeat was definitely rising very quickly when we realised there was an issue. We came in, restarted the car which seemed to solve the problem. It was good to go out and get a feel for the car in the conditions, as Lewis touched on it was very tricky. "Q3 wasn’t perfect, I would have loved to have a second go. I felt there was some time to gain. Very close, too close, the margin was possible to go that much faster. At the end of the day, it’s good to be on the front row, I think I should be on the good side tomorrow, it depends on how good the start is, but very happy with the result." Press conference quotes - Nico Rosberg: "I was a little bit less comfortable on the full wets, especially on braking. It’s still a decent place to be, third place. The race is going to be long tomorrow, who knows what the weather is going to be. That’s okay. Just looking forward to tomorrow now." Press conference quotes - Lewis Hamilton: "For myself and for the team, the priority is to try and bag as many points, collectively, me and Nico. I think we have a good opportunity, we have a great car… fingers crossed we both see our way to the finish line." Thus, a delayed but worth waiting for qualifying session draws to a close. Not a huge surprise to see the Mercedes pair on top, but they didn't have it all their own way today. Lotus showed signs of improvement, whilst Williams continue to be frustrated by the conditions - they'll perhaps be hoping for a dry race tomorrow. Despite the weather, the back end of the grid was as expected. There were a few incidents to be investigated after the event, but I can't see any major penalties being applied. Join me again tomorrow for all the racing action. Those in the UK need to be aware of the clocks going forward in the early hours, and I will see you back here for lap by lap coverage of the Malaysian Grand Prix!